The bathroom – where practicality meets functionality. The need for a sanctuary to unwind and relax in must be balanced with practical storage requirements. At BAC Custom Cabinets and Kitchens, we understand this, and are experts in creating custom bathroom cabinets for Perth families. No matter what your bathroom cabinet goals, we can work with you to create a functional and high quality solution without sacrificing style. Whether you are building a new home or completing your dream renovation, BAC will provide personalised service, high quality and attention to detail. As Perth’s expert custom bathroom cabinet makers, we approach each project with a focus on your end goal. Whether you have a growing family and need a new style of bathroom, are looking for a solution to update your cabinets, or are undertaking a complete bathroom renovation, we will design an intelligent and unique solution. Our inspiration comes from leading design trends, ensuring your bathroom will be tastefully and intelligently designed. 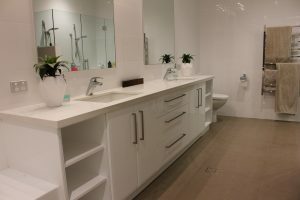 It’s what makes us the go-to bathroom cabinet makers in Perth. BAC proudly use Australian and European made materials and hardware, including Blum and Caesarstone. We work with you to ensure you select the right materials for your lifestyle and needs. This includes stone, granite, laminate or timber for your bench top surfaces and a wide selection of doors, handles, and closing mechanisms. Our carefully selected, qualified tradesmen complete all work to the highest quality. 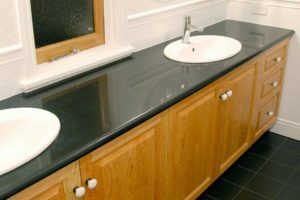 We ensure effective project management that guarantees all aspects of your custom bathroom cabinet project will be rolled out on an efficient schedule and you’re informed of when your tradesmen will be onsite. Or, if you have a favourite tradie we’re more than happy to work with them too. 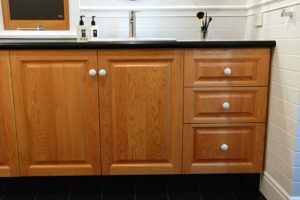 BAC Custom Cabinets and Kitchens will come to your home to discuss your custom bathroom cabinet requirements and provide a free design consultation and written quote. 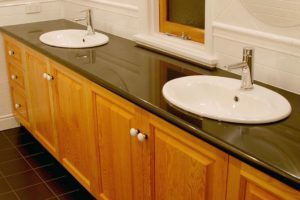 We custom design your bathroom cabinets. Our designer will even create full colour 3D images so you know exactly what your custom cabinets will look like. 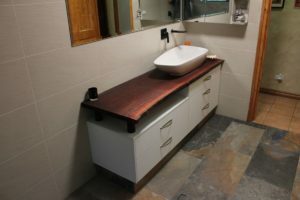 Using only premium supplies, we hand make your custom bathroom cabinets right here in Perth.